I was sad to read that one of my all-time favourite bands, Rush, are “basically done” after 41 years of music making. 40 years on, the last 4 lines quoted from A Farewell to Kings above (to me, at least) well-describe many of today’s most powerful world leaders. Though they were unfashionable for much of their career, Neil Peart, Alex Lifeson and Geddy Lee can each stake a claim to being the all-time best Rock exponent of their particular musical instrument, whether that’s drums, guitar or bass. On 18 April 2013, Rush were inducted into the Rock and Roll Hall of Fame. Alex Lifeson’s acceptance “speech” made clear reference to the length of time it had taken for them to achieve that recognition. Time “problems” affect all of us and in this article we’re going to look at 3 ways in which time factors have relevance – and can be problematic – in relation to Legal Expenses Insurance (LEI) for personal injury claims. Note that, in this article, by LEI, we mean “before the event” insurance, which is a narrow definition of LEI. If you have it, LEI is a type of insurance which you will have in place already. In other words, you will have had the insurance in place before you suffered your accident. It will entitle you to legal advice and representation regarding a potential personal injury compensation claim. How do you know if you’ve got LEI? Well, LEI is often an add-on to another insurance policy, especially a house contents insurance policy. The major benefit of LEI is that it is one way of removing the financial risk associated with claiming personal injury compensation (other examples being legal aid and “no win-no fee”). In the first place, timing is important relative to which LEI policy will apply in your case. Secondly, timing may be crucial in relation to whether LEI applies at all. And, finally, time factors can be influential once LEI is in place and your claim is ongoing. 1. Which LEI policy will apply? If you’re someone who sticks with the same insurer for many years at a time, what we are talking about here will not be so much of an issue for you as it will be for someone who changes their insurer, say, annually. The point is that the insurance policy which will apply in your case will be the one which was in force at the time of the accident. That will not necessarily be the same policy as it is in place at the time you decide to make your claim. Of course, time limits apply to personal injury claims and it is always a good idea to get legal advice as soon as possible following an accident. However, if you have LEI but change insurer annually on the renewal date, where you decide to claim 2 years after an accident, you will need to look back to see who your insurer was at the date of the accident. This is an argument for not throwing out past insurance policies and documents as soon as they seem to have expired. You may still need to refer to them later. 2. LEI – how long do you have to claim? The second time factor relating to LEI policies is in the amount of time you have to tell the LEI insurer that you have a potential claim and you want to be covered by the policy. Most policies contain time limits for intimation of claims to the LEI insurer. As you can see, in the one above, the insurer is saying that the cover under the LEI policy will not apply if the incident is not reported to them within 6 months of it happening. Our experience is that, in practice, many LEI insurers will not insist on this exclusion. realise that they have to notify the insurer if they want to keep alive the possibility of the cover. On the other hand, if the exclusion is stated clearly and forms part of the contact, the insurers could hold you to this and you might find that what seems to be a perfectly good and relevant insurance policy is worthless in your circumstances due to your delay in claiming. The final point about time and legal expenses insurance is that, like all insurers, they do not tend to do things very quickly. Response times of at least one month can be expected and we have had experience of situations where we have had to make a formal complaint about a LEI insurer because they had not responded to correspondence within 6 months. Where an insurer is involved (or the legal aid board, for that matter), there is generally a requirement to get authority from the insurer to keep going with the claim at different stages and to incur significant outlays such as liability expert reports or medico-legal reports. The delays can mount up and, where cases still it the investigation stage, it can cause problems if the time bar for the claim is approaching. We are not saying that anyone should Rush into making a personal injury claim. On the other hand, everything about LEI insurance indicates that it is a good idea to initiate any claim as soon as possible. As we have seen, you will want to make sure that you identify which LEI policy is the correct policy. In other words, which policy was in force on the date of your accident? There may be a time limit exclusion within the policy itself. It may be essential for you to notify the LEI insurer of your potential claim for legal expenses cover under the policy within a fairly short period of time. You might have as long as one year but periods of 6 months or 90 days are possible. It’s important to check the terms and conditions of the policy as soon as possible, so you don’t fall foul of this potential barrier to insurance cover. Finally, the progress of a claim under LEI insurance can be held back by the need at each stage to get permission from the insurer to proceed further. The insurer will want to review whether reasonable prospects still exist with the claim each time you get an additional piece of evidence. The insurer will also want to have a clear idea of their potential liability for costs at each stage and will want to be persuaded that any additional evidence your solicitor wants to get is reasonable and economic in the context of your claim. 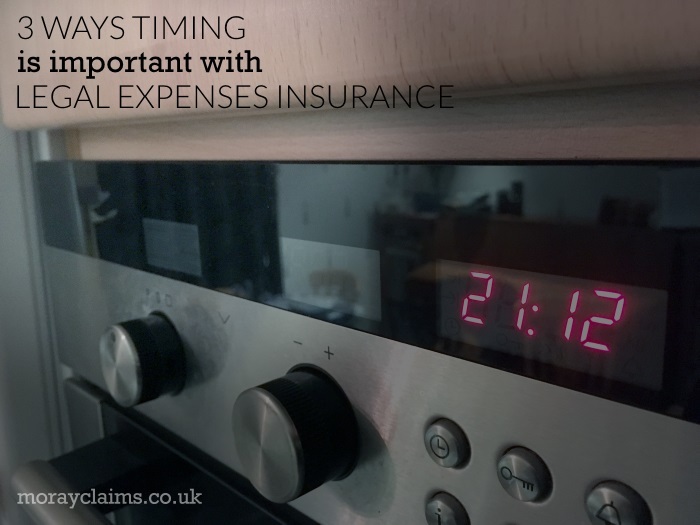 In this article, we discussed 3 ways timing is important with legal expenses insurance in the context of a possible personal injury claim. If you have any questions about this article or anything to do with the personal injury compensation claims services Moray Claims / Grigor & Young provide in Moray, please get in touch with us. All initial enquiries are free of charge and without obligation. You can call either of our specialist accredited solicitors – Marie and Peter (Peter wrote this article) – on 01343 544077 or you can send us a Free Online Enquiry. The article above treats Legal Expenses Insurance as being “before the event” insurance (and not “after the event” insurance), which is probably not correct. Another article – on the Grigor & Young website – discusses what is legal expenses insurance, generally, and treats BTE/ATE as both being forms of LEI (which they are). And there’s also an article – When does LEI cover you for a personal injury claim? – on this website, which you may find helpful.